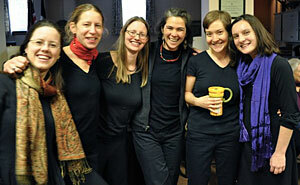 The Brattleboro Chorus is best known for its twice yearly concerts, showcasing four-part choral singing. Our fall concert is in November, always the weekend just before Thanksgiving. Our annual spring concert is on Mother's Day weekend. Both concerts feature well-known local musicians who accompany the chorus usually on Saturday evening and Sunday afternoon. CLICK HERE for information on our upcoming concerts! In addition to our two concert weekends, we occasionally host events that are open to the public as well as community outreach events and other events that are open to the public.